In preparing to move a load, make sure that the pallet jack matches the size of the pallet. 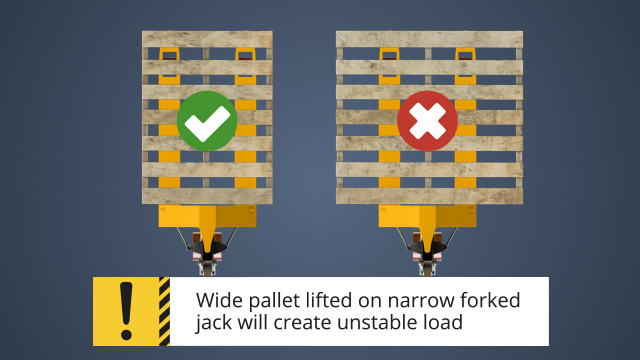 A wide pallet lifted on a narrow jack may create an unstable load. When a load must be positioned by pulling it, reduce the chance of injury by keeping both hands on the jack handle, keeping your back straight and applying even constant pressure to the load. 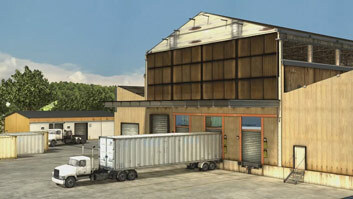 Be aware that the pallet and load is wider than the jack and maneuver carefully to avoid striking door frames, racking, or other structures. 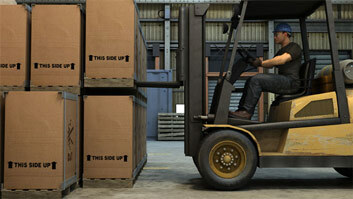 If your vision is obscured by the height or width of a load, use a spotter to help out. A pallet jack is a relatively simple device that allows a person to pick up and move a palletized load which can weigh several times that of the operator. A typical manual pallet jack consists of a small frame that supports two low forks that are designed to fit under a pallet. A handle, or tiller, connected to the frame provides a method to push or pull the jack, to steer it, and a way to hydraulically elevate the forks. This course will focus on the principles of operation and instructions for safe use of the manual type of pallet jack. How does a pallet jack elevate a load? Moving the handle on a pallet jack up and down pressurizes a hydraulic cylinder that raises the forks of the pallet jack. What is the appropriate PPE for pallet jack operation? PPE requirements vary by company, but generally when working around pallet jacks and heavy loads, steel toe boots should be worn. 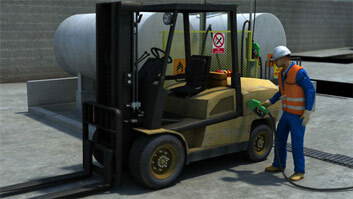 Gloves are important to protect hands and high visibility vests are usually required in warehouse settings. 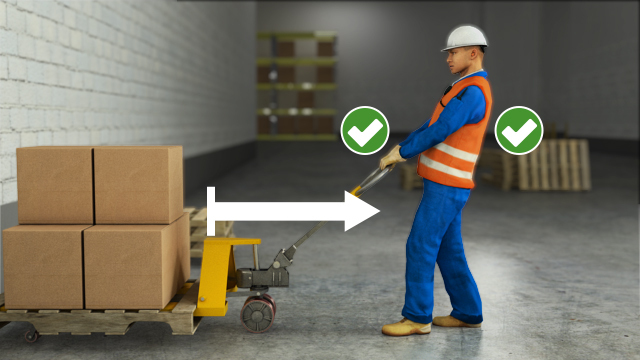 Is it ergonomically better to push or pull a loaded pallet jack? Pushing a pallet jack and load is the biomechanically preferred way to apply force to the load. When a pallet jack is not being used, how should it be stored? 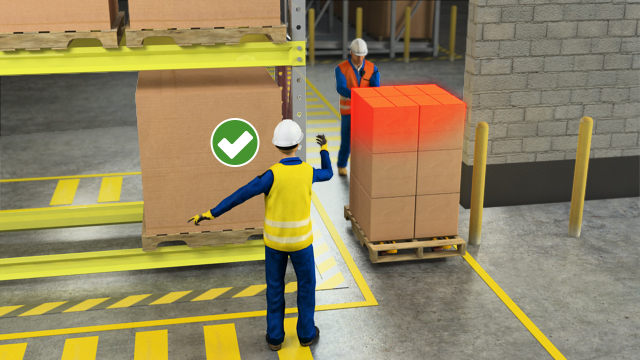 When a pallet jacket is parked, the forks should be in their lowest position, the handle should in the upright position for visibility and it should not block exits or access to emergency equipment such a fire extinguishers. How should you approach an incline with a loaded pallet jack? It is best to avoid inclines with a loaded pallet jack, but if you must use an inclined ramp, always make sure that you remain up the ramp slope from the load. 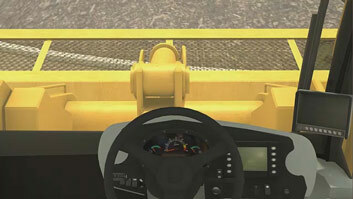 When the forks are under the skid, the lever on the handle can be pulled down toward the floor, away from the pallet, and then pushed back up and returned to a near vertical position. Moving the handle up and down repeatedly pumps fluid from a small reservoir into the cylinder. 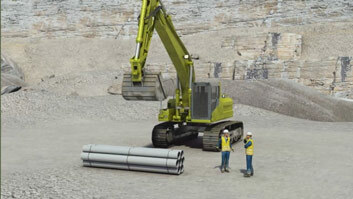 As the fluid is pumped, the hydraulic cylinder extends. This action is transferred by levers and linkages to the wheels at the front of the forks. The end result is that the forks raise up and lift the pallet off the ground. Once the pallet is elevated, the handle of the jack can be pushed and pulled to relocate the load. 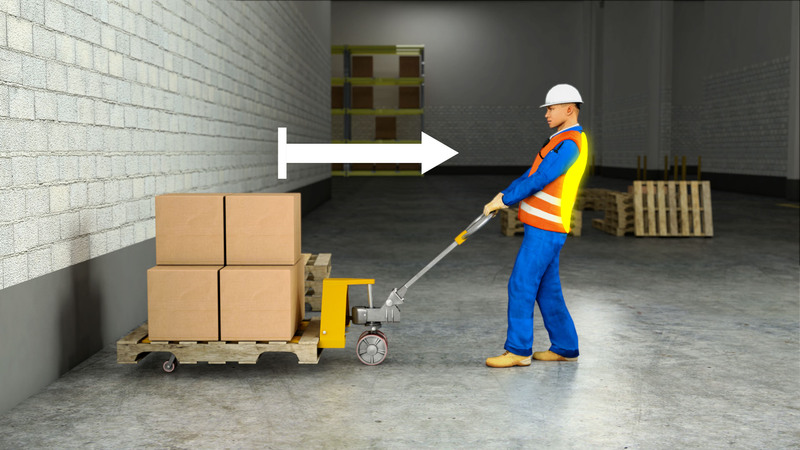 Once the pallet has been moved, the lever on the handle is pulled up, the pressure is released, the forks drop down, and the forks can be withdrawn from the pallet.